COLLECTORS SELECT, the Arlington Arts Center has collaborated with notable area collectors to create six distinctive exhibitions, each exploring a different theme or aspect of contemporary art practice. The show encompasses everything from traditional sculpture and painting, to video and installation, to graffiti. Artists included range from emerging local talent to established international figures. In this show, the Podestas highlight work that includes references to the natural landscape. The show includes photographic works by D.C. performance artist Kathryn Cornelius; traditional, technically exquisite landscape photography by Steve Alterman; and a site specific stone and wire sculpture that will flow dramatically from floor to ceiling by Barbara Liotta. Barlow explores the themes that have long driven his collecting—and curatorial—habits: Geometric abstraction, architectural ornament, and numbers or codes. 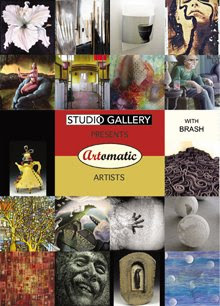 Featured in the show are paintings and drawings by Simon Gouverneur, Wayne Edson Bryan, Tomas Rivas, and Michele Kong. The Pink Line Project’s Philippa Hughes showcases Washington, D.C. graffiti artist Tim Conlon—who, along with his crew, will work directly on the walls of the Tiffany gallery, making a large mural that will provide a jarring counterpoint to the Center’s 1930s floor-to-ceiling lead Tiffany windows. Levinas, an avid collector of avante-garde Latin American art, brings an international art star to the Center: León Ferrari, winner of the Golden Lion in the 52nd Venice Biennale in 2007. Ferrari will exhibit his heliographs—large prints that resemble labyrinthine city plans, and reflect on the political oppression of the Argentinean military dictatorship in the 1980s. Thaggert focuses on the videos and photographs of Bradley McCallum and Jacqueline Tarry, a married bi-racial performance art duo from Brooklyn whose works explore issues of race, gender, and trust. Closing event: Friday, February 22, 2008, 6 p.m. to 8 p.m. The event will feature Bill Schmidt, Alan Jabbour and other talented musicians who will perform an assortment of Appalachian fiddle and banjo music, which largely inspired Schmidt's work. Way, Shape, and Form: Small Abstract Paintings, an exhibition by Bill Schmidt, features a selection of paintings in gouache with details in colored pencil and water-soluble crayon.The selected works display Schmidt's signature miniature, geometric paintings. Tools As Art, Two: Selections from the Hechinger Collection, features a selection from IA's permanent collection donated by home improvement store magnet John Hechinger and his family. This will be HAS's second exhibition featuring the collection of 20th century art representing and incorporating tools and hardware. IA's Hillyer Art Space is funded in part by the DC Commission on the Arts and Humanities, an agency supported in part by the National Endowment for the Arts. International Arts and Artists announces that it has developed a membership program which will further serve the arts community of the Washington area. At Friday's reception IA will officially launch the new movement and invites you to join in. Visit the Aaron Gallery and Dupont Circle Galleries for First Friday Gallery Walk. All area galleries open new exhibitions on the first Friday on every month. Juror: Vivienne Lassman, Washington DC Art Consultant and Independent Curator. Project 4 celebrates its two-year anniversary in February with an exhibition of new works by a selection of gallery artists as well as a preview of artists being introduced this year. Ideas of ornament and nature reoccur in selected works as do investigations of special concerns. Crystal Flight is coming to Crystal City in April 2008. These are pics from the Artist/Sponsor Kick-Off Party. Find more information at Crystal Flight Blog. You get reach it by going to www.crystalcity.org and then clicking on the “Blogs” button on the left hand side of the screen. Christian Benefiel, Brent Crothers, Joel D'Orazio, Pattie Porter Firestone, Frank Fishburne, Breon Gilleran, Michael A. Guadagno, Leonard Harris, James Kessler, Jin Lee, Carol Gellner Levin, Mitra Lore, Phelan Meek, Judy Sutton Moore, William J. Moore, Lincoln Mudd, Mahasti Y. Mudd, Marie Park, Tom Rooney, Richard Schellenberg, Mike Shaffer, Bo Simeon, Frances Sniffen, Pamela Soldwedel-Barrett, Ron Van Delden, Raymonde Van Santen, George Tkabladze, Sarah Wegner, Elizabeth Whiteley, and Joyce Zipperer. Take a look at this interesting interview with Eric Maisel about creativity, meaning and depression. He discusses his informative book The Van Gogh Blues. The show will be up for the observance of the 5th anniversary of the U.S. invasion of Iraq and the March 19, 2008 “March for Peace” in Washington and other cities around the country. Warehouse Gallery will schedule some peace events during the show and welcome ideas. Jpegs work best. Explanation and description is fine for installation and video. The show will feature painting, sculpture, installation, photography, video, etc. The list of earlier Peace shows at Warehouse. At each stop along the way on The Van Gogh Blues tour, Eric Maisel will answer questions and deepen your understanding of the book’s key concepts about creativity, meaning, and depression. Cynthia Morris is an expert on the creative process and encourages others to embrace life as a creative adventure. At her blog, you can join the others who are learning how to thrive creatively and complete creative projects with joy and ease. Megan blogs about her interests, her artistic creations, her aspirations and her inspirations. Dani Greer is a professional artist, writer, and avid reader. She regularly hosts her favorite authors on their blog book tours in support of environmentally conscious practices. Blog books tours burn less petroleum. Lois' thoughts on gardening and environmental issues run the gamut from gardening in her own back yard to promoting land management practices that reconnect people to the Earth. As a field editor for Better Homes and Gardens Special Interest Media, she enjoys visiting and writing about other people's gardens. An active participant in local politics, she advocates for open space preservation, sustainable development, and green building. Austere’s blog is an anonymous account about life and living in Mumbai, India; veering from the gritty realistic to the dreamy, rose-tinted; for she tends to get excited about things like lights on trees, stars on the silver screen and the sky, and the stock market. Melissa’s blog samples her daily life, issues that concern and inspire her, with a slant toward the art of writing and scrapbooking, two her favorite modes of creative expression. While acknowledging fashion as a reflection of cultural trends and historical events, Ms. McCullough takes this one step further and creates dresses that embody the detritus of life as commentary. Friday: 9 a.m.-9 p.m. Sunday: 2 p.m.-5 p.m.
A discussion between Frank Goodyear, Anne Goodyear, and Chan Chao on Portraits in Contemporary Art. Anne Goodyear, Assistant Curator of Prints and Drawings, National Portrait Gallery Smithsonian Institution. Chan Chao, highlighted artist in the current show, Portraits. Chao has published two books of photographic portraits, Burma, Something Went Wrong, and Echo. At 12 p.m. on Wednesday January 30, the public is invited to the Wilson Building for a guided tour through the City Hall public collection of art on permanent display on floors 1-5 of the Wilson building. The tour will be led by a local artist featured in the collection- Ellyn Weiss. The City Hall Collection, "HeArt of the City", has been assembled over the past two years under the sponsorship of the DC Commission on the Arts and Humanities. It is the richest and largest permanent exhibition of the work of local artists in the city, featuring a broad range of work, from internationally known artists such as Jacob Kainen, Sam Gilliam and William Christenberry, to work by most of the artists of significance working in our area now. All styles and media are included. The collection truly provides a window into the scope of creative talent and energy that DC offers today. This is a unique chance to enjoy the collection along with one of the artists and to share your responses. This will be a bi-monthly occurrence. The tour is free; however space is limited. Please RSVP to beth.baldwin@dc.gov with the number in your party. Meet at the receptionist's desk on the first floor near the Pennsylvania Avenue entrance - the building is located at 1350 Pennsylvania Ave NW. ID is required to enter the building. Lecture by Nevin J. Kelly on Polish artists featured in the gallery followed by refreshments. Nevin Kelly Gallery presents AN IDEAL MIX-UP, a group exhibition that includes works by the contemporary Polish artists that helped launch the gallery in May 2003 and the many local artists who have joined the gallery along the way. The exhibition celebrates both the gallery's origins and its development as a platform for showcasing emerging trends in local art. The exhibition will feature works by local artists Sondra Arkin, Joan Belmar, Ellyn Weiss, Mary Chiaramonte and Laurel Hauler and by Polish artists Edward Dwurnik, Darek Pala, Krzysztof Kokoryn, Pawel Król, Lukasz Huculak and Michal Zaborowski. In todays WaPo, an interesting look at how art, celebrity and social issues mingle, Photos by international artist Vanessa Beecroft with filmmaker Pietra Brettkelly in Sudan two years ago. Article by Washington Post Writer William Booth. Article. District Fine Arts presents "Alter Ego," featuring drawings by Elliott Negin and prints and paintings by Groover Cleveland. A week of performances, screenings, films and lectures in collaboration with The Pink Line Project, Civilian Art Projects, Goethe-Institute and others. Reception & Panel Discussion: Thursday, January 24, 4:30-6pm. St. Mary's College of Maryland presents Via Simbolica, artworks by Liset Castillo, Justine Reyes, and Jose Ruiz. The public is invited to a free reception and panel discussion with the artists on Thursday, Jan. 24. Curator Sarah Tanguy holds an MA in Art History from the University of North Carolina, Chapel Hill, and is curator for the ART in Embassies Program for the U.S. Department of State. She is also an independent curator and art critic based in Washington. Tanguy has curated more than 150 exhibitions. She will join the artists for the Jan. 24 panel discussion. Transformer kicks off the new year with the 7th installment of the dynamic FRAMEWORK Panel Series. Designed as a facilitated discussion focused on the changing values and practices in the sphere of art education, Art School, Confidential: Rethinking Art Education brings together an esteemed group of area artists and professors in a dialogue about the influence of art schools in the lives of artists and on the direction of contemporary art-making within the larger arts landscape. Featuring panelists Billy Colbert (Adjunct Faculty, American University), Maggie Michael, Brandon Morse (Associate Professor of Digital Media & Director of Graduate Studies in the Department of Art, University of Maryland, College Park, MD), Renee Stout, and Rex Weil (Professor of Art Theory, University of Maryland, College Park, MD), and moderated by Dean Kessman (Assistant Professor of Photography, George Washington University), the panel discussion will be followed by a thirty minute question and answer segment with the audience. Attendance for this event is free. Seating will be on a first come, first seated basis. At each stop along the way on The Van Gogh Blues tour, Eric Maisel will answer questions and deepen your understanding of the book’s key concepts about creativity, meaning, and depression. Come visit for a day or follow the whole tour and acquaint yourself with a host of new blogs of interest. acrylics, mixed media and collage. 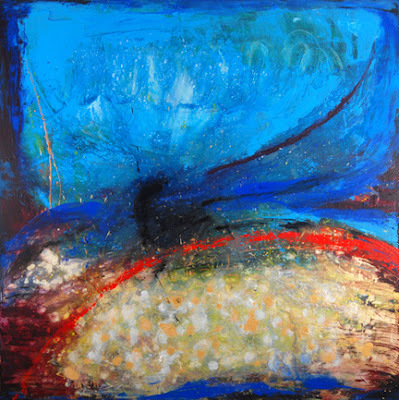 Deb explores life as an artist, mixed media and abstract painting techniques, studio habits, and creative inspiration. A community for creativity. Daily exercises to kickstart the imagination. Sharing resources and information about grants, jobs and opportunities in the arts. All artists welcome. Becky uses The Prodigal Journal as a tool to help her recognize and make meaning in her life as an artist/writer and homeschooling mother to her daughter. Daily ups and downs, small triumphs, big worries, coping with her own depression and her child’s possible Asperger’s Syndrome, successful artistic efforts, and frustrations over not so successful efforts are all fair game for The Prodigal Journal. Eric will be hosted by a different blog each day. Each host was a winner of Artella's Weekly Blog Topic of the Week Challenge. In his first solo show at District of Columbia Arts Center, Matthew Langley is showing paintings and paperworks that explore multiple mediums but ultimately investigate an approach to painting from divergent strategies - one of building - the other of reducing. This process-based approach, combined with traditional easel painting, allows Mr. Langley to develop works that are multifaceted, while continuing to advance a reductive approach. Molly and Paul Ruppert have scheduled three informal conversations and music to brainstorm ideas for the future of the Warehouse. They are interested in trying to define the space needs of the artistic community within their area of interest and experience. Exhibition space? Galleries ? Non profits? Studio space? Live/Work space? Storage space? Art Communities- real or virtual? What are other people / organizations working on? There is a steady call for additional arts space of every variety. In these meetings Molly and Paul will focus on specific needs and opportunities. The Warehouse has thrived for the last 13 years by responding to the artistic community. It continues to do so. Co-curator Vivienne Lassman leads tours of the Walter E. Washington Convention Center’s art collection – the largest collection in DC that is not in a museum. The $4 million permanent art installation features paintings, sculptures, photography, graphics, and mixed media works created by local, national, and international artists. Linn MEYERS will be giving a talk at the Hirshhorn Museum and Sculpture Garden with curatorial research associate Ryan Hill on Currents: Recent Acquisitions, a show that includes Meyers’s work. Looking for a great arts resource locator... check out Malik M. Lloyd's listings at FIND ART INFORMATION BANK, an award winning service for the DC area. Randall Scott Gallery presents new paintings and mixed-media works by Lawrence Gipe. In this current series, Gipe re-represents archival photographs as oil paintings and drawings, continuing his strategy of severing historical images from their original, politically charged contexts. Adamson Gallery presents the first Washington area exhibition of works by Lyle Ashton Harris. Harris' pieces have been featured in the 2007 Venice Biennale, the Whitney Museum of American Art and the Museum of Contemporary Art in Los Angeles. Curator's office presents a twist on portraiture for its inaugural exhibition of 2008. Co-curated by artists Linda Hesh and Ian Jehle, this exhibition includes works in a range of media by emerging and established artists including Colby Caldwell, Kathryn Cornelius, Joseph Dumbacher and John Dumbacher, Nekisha Durrett, Alberto Gaitán, Max Hirshfeld, Linda Hesh, James Huckenpahler, Ian Jehle, Amanda Kleinman, Al Miner, Rob Parrish, Eric Powell, Robin Rose, and Jeff Spaulding. Recent drawings, light installations, and video. Artist talk begins at 7pm. Reception Saturday, March 29, 5:30–7:30 p.m.
Jodi Walsh: artist, national speaker and creator of the original “Tribute to Fiber Art” Juried Exhibition at APEX Gallery, 7th Street, Washington DC. BRCA staff will assist in the over all selection of work. Open to all fiber artists residing in Maryland, Virginia and Washington, D.C. over the age of 18. As in the tradition of the original “Tribute to Fiber Art” juried exhibition, a solo exhibition the following year will be awarded. Phil Nesmith’s first solo exhibition, My Baghdad, a series of photographs shot in Baghdad and produced on glass plates using a dry plate ambrotype process. A set of editioned C-print enlargements from the glass plates will accompany the unique images in the exhibition. These evenings of conversation have become a central component of Artist House, bridging art and ideas within a community setting. Vibrant three-dimensional mixed media and sculpture by Washington area artists from the Black Artists of DC (BADC) collective will add color and interest to the gallery space at 1111 Pennsylvania Avenue during Black History Month, as well as before and beyond. The portraits of more than 100 homeless families, all former residents of the now-closed D.C. Village shelter, will be displayed in the atrium of the John A. Wilson Building through Jan. 14. January's Artistically Speaking web is online with Marilou Donahue's interviews of Director/Actor, NICK OLCOTT and Actor, MORGAN FREEMAN here. 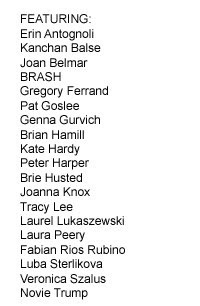 HAMILTONIAN ARTISTS announced the selection of an External Advisory Review Panel. 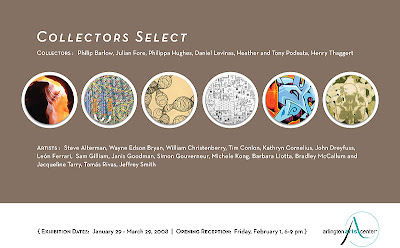 This distinguished panel of artists and art professionals will be tasked to help select the first group of 10 So-Hamiltonian Fellows + 3 alternates for the inaugural season in 2008. HAMILTONIAN ARTISTS continues to accept applications for the So-Hamiltonian Fellowship Program until the DEADLINE on JANUARY 15, 2008. Application information is online. Check the blog for the latest update. Portraits includes the work of contemporary photographers, Chan CHAO, Rineke DIJKSTRA, Zwelethu MTHETHWA, Collier SCHORR, Malick SIDIBE, Alec SOTH, and Beat STREULI. The show previews new work by Chan CHAO and includes a large-scale window installation by Beat STREULI. Virginia artist Josephine Haden will be exhibiting work in a group exhibition in New York City at the Denise Bibro Fine Art Gallery this month. If you visit Manhatten, plan to stop in and see her work. 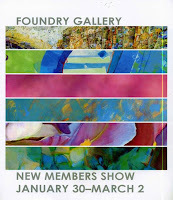 Opening reception: Thursday, January 17th from 6 - 8 pm. Krista Birnbaum: Trash Pile w/Weeds, digital inkjet print, 2008Artists are Kathryn Cornelius, performance; Susan Raab, photography; Krista Birnbaum, graphics; Cynthia Connolly, performance; Christine Bailey, drawings; Carolina Mayorga, performance; Joanmarie Turbek, installation. This is a juried show featuring works picked by gallerist Martin Irvine, curator Welmoed Laanstra and art critic Kriston Capps. They chose 7 artists whose works explore the relationship between consumption, mass reproduction, marketing and art. How we live our lives is very much on my mind, as I'm sure it is on millions who are setting goals this month. With 2007 behind us and 2008 in action, I'm excited to be participating in a blog tour with Eric Maisel. Do you remember "Ten Zen Seconds"? Well, Eric Maisel has released another of his books, The Van Gogh Blues in paperback. The Van Gogh Blues Blog Tour starts in ten days. I am happy to host Eric Maisel on my blog on February 11 as part of the eight week blog tour. Be sure to visit. I will be posting more information about the blog tour schedule soon. In this series Eric Maisel looks at the relationships among creativity, meaning, and depression and answers some fundamental questions about why creative people have an extra measure of depression to deal with, the measure that arrives because of our existential concerns and because of the way that we experience meaning as challenging and problematic. In this week’s show Eric looks at what happens when life loses its meaning and a meaning crisis is precipitated. Good listening! Shake off those blues with meaning. Ringing in the New Year, Zenith displays new works in its January showcase, juxtaposed with pieces from the LOWCOUNTRY: Art of South Carolina show, which was featured in December and has been extended by popular demand. New artists making their Zenith Gallery debut, Spanish painter Cavadonga Sarragua Leyva and Washington area painter Ted Kliman add a classical, almost timeless, viewpoint to the gallery repertoire. Both excellent painters and draftsmen, they explore the human form in unique and interesting ways. hoogrrl has posted some fabulous photos of the Transformer Auction taken by photographer Darren Santos. Check them out! Irvine Contemporary presents Reunion, a group exhibition of new works by gallery artists to introduce the 2008 season. Artists include Teo González, Paul D. Miller (DJ Spooky), Lori Esposito, Melissa Ichiuji, Akemi Maegawa, Joseph McSpadden, Kahn & Selesnick, Ryan Pierce, Izel Vargas, and Oliver Vernon. A screening of Paul D. Miller’s New York is Now will be included in the exhibition. Dont miss it...These are the last days his weekend, to see Saturnalia: Festival of Gallery Artists for the Winter Season, a special exhibition of gallery artists for the holiday season until January 05, 2008. 58"W x 48"H x 3"
H&F Fine Arts is pleased to present concurrent solo shows of works by Alan Binstock and Joan Belmar. Both artists’ work explores the circle of life and construct dialogue assessing the parallels of three dimensional abstract structures and human life. Belmar’s work will serve as a layered backdrop to the translucent sculptures created by Binstock. Alan Binstock’s work explores the forms that express or reflect the sacred, the inner life; varied manifestations of the micro and macro worlds. Many years of work as an architect and now in Master Planning at NASA, Binstock’s work is a result of deep space images and ideas that arise from his observation, reflection and meditation. Whether six inches or 60 inches tall there is an compelling mix of steel and glass, Binstock pushes glass to it’s limit…chiseling as if it were stone. Experimentation with materials such as plastic, acetate, polycarbonate, Mylar, and glass, allows Joan Belmar to create worlds where the viewer is allowed to see some things clearly and some things opaquely. But all things seen are intended to reflect an outer and inner world of psychological stress, fragility and dislocation. Belmar’s work takes on a cosmic-like illusion that carefully entwines photography and optical effects. For questions email Deirdre Ehlen at Deirdre.Ehlen@dc.gov or call (202) 724-5613. Deadline: 5pm, January 18, 2008. Maryland Art Place (MAP) announces a call for proposals for the Sixth Annual Curators' Incubator. The exhibition is scheduled to take place September 16-October 28, 2008. A small number of curatorial semi-finalists (comprised of either individual curators or curatorial teams) will be selected, with the expectation that curators meet with MAP's staff and Programming Advisory Committee to provide more in-depth detail about their intentions and goals. Curatorial finalists will fully develop their exhibition and publication materials and present their proposals to the Committee for final consideration in Spring 2008. Visit http://www.mdartplace.org/ or call to speak with a MAP staff member at (410) 962-8565. Thank you DC, friends, family and collectors for sharing a great art vision in 2007. And to Painterly Visions Blog readers, may your new year be filled with love, happiness and peace in all forms. Stay connected in the new year ... thankful, gracious and creative.